Research for Part 2 of my book brought me to the above. 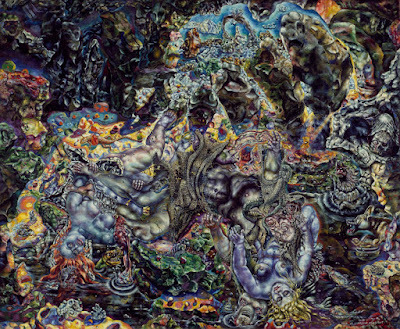 Observe the dark, Fruity Pebbles-flavored phantasmagoria that is Ivan Albright's rendition of The Temptation of Saint Anthony from 1946. I encountered this through my study of Salvador Dali's version of the Saint Anthony story (the focus of my book). A contest in 1946 brought together a dozen of the period's greatest painters to render the Temptation of Saint Anthony. Dali, despite creating one of his most iconic works, finished in fourth. Max Ernst won, deservedly so. Albright had previously won a similar contest, getting his Picture of Dorian Gray into a film rendition of Wilde's novel. Albright finished an impressive second in the contest. His version is astounding to me. That look on Saint Anthony's face, once you make it out through the enveloping phantasms, is so perfect. 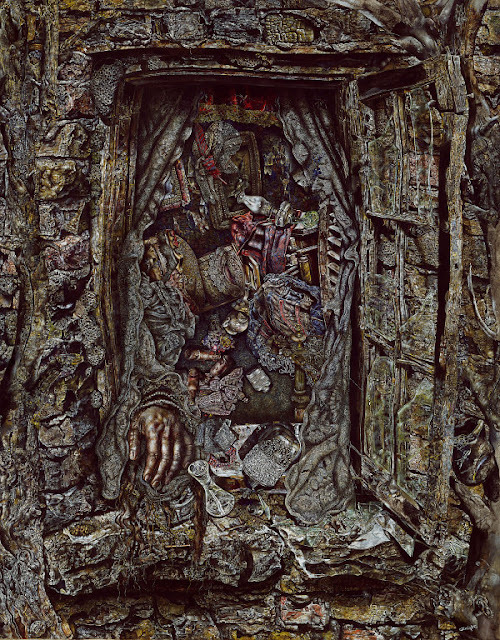 Albright's work often seems to be beautifully, horrifically gross. In Saint Anthony, the gross is turned down, and the beautiful ramped up by a vibrant color selection. The awestruck response I had to this painting led me to look into Albright's work where I found another painting I've been rapturously gaping at recently, Poor Room. 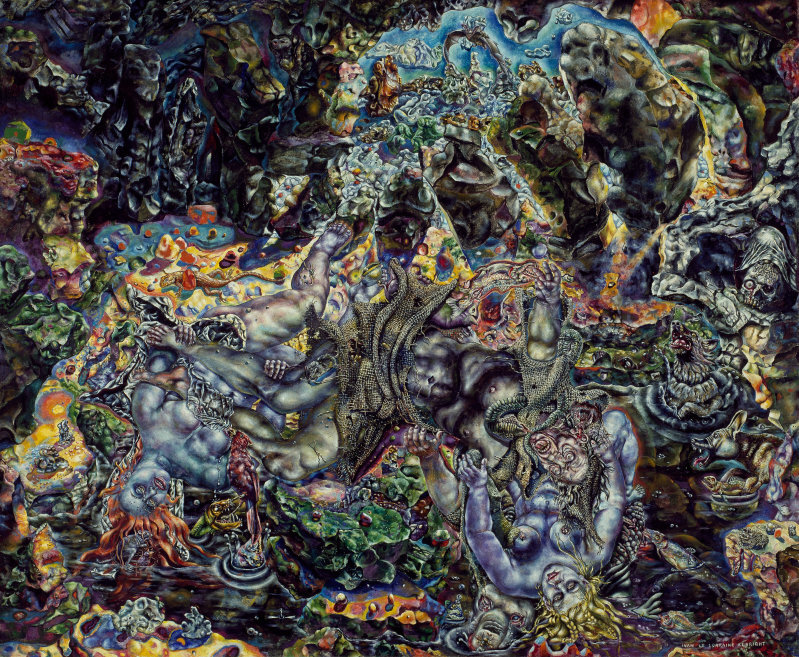 Albright's work rewards a microscopic focus and is macroscopically pleasing to the eye. That corroded frame in Poor Room draws me right in. His technique and execution is phenomenal. And the dude was from Illinois, of all places. 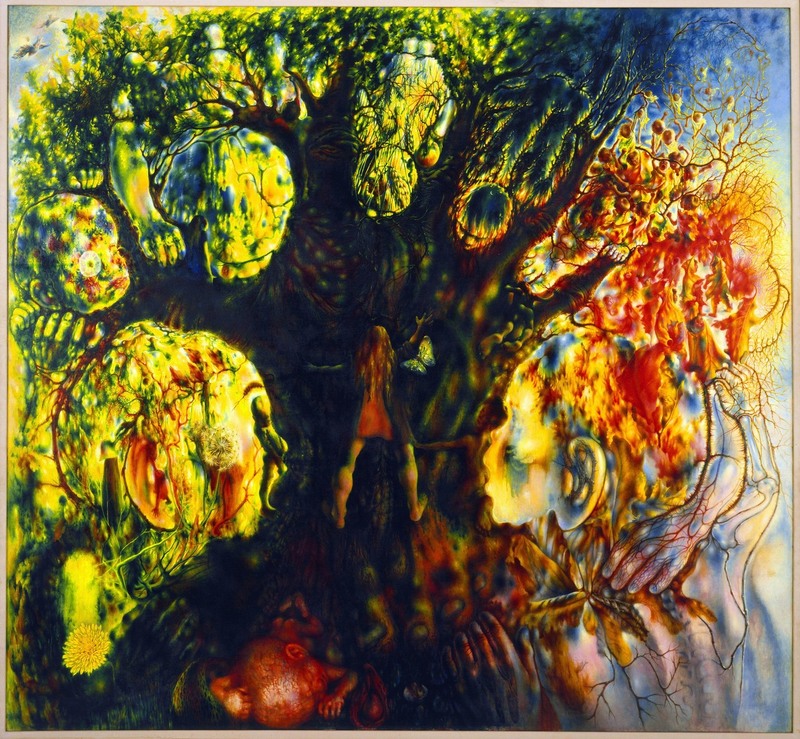 Davenport has an especial affinity for Pavel Tchelitchew, a Russian-born painter who was a contemporary of Albright (and Dali et al) in the first half of the 20th century. Davenport has an essay on Tchelitchew, more specifically a glowing review of a newly published biographical study of the artist entitled The Divine Comedy of Pavel Tchelitchew: A Biography (1967), and otherwise sprinkles Tchelitchew into his writings often. 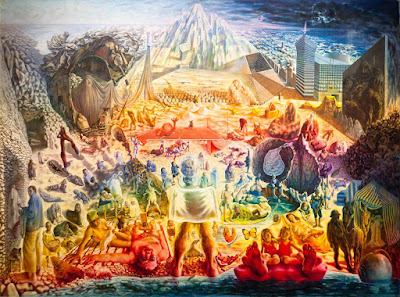 Throughout Geography of the Imagination, Davenport frequently lavishes praise and appreciative analysis on an enormous painting called Cache-Cache or Hide-and-Seek (1942). I'd seen this image once before many years ago but lately have been deeply absorbed in it. There is a magic to this painting. I can stare it for hours and hours. I regret somehow missing out on it during my last trip to the Museum of Modern Art in New York. 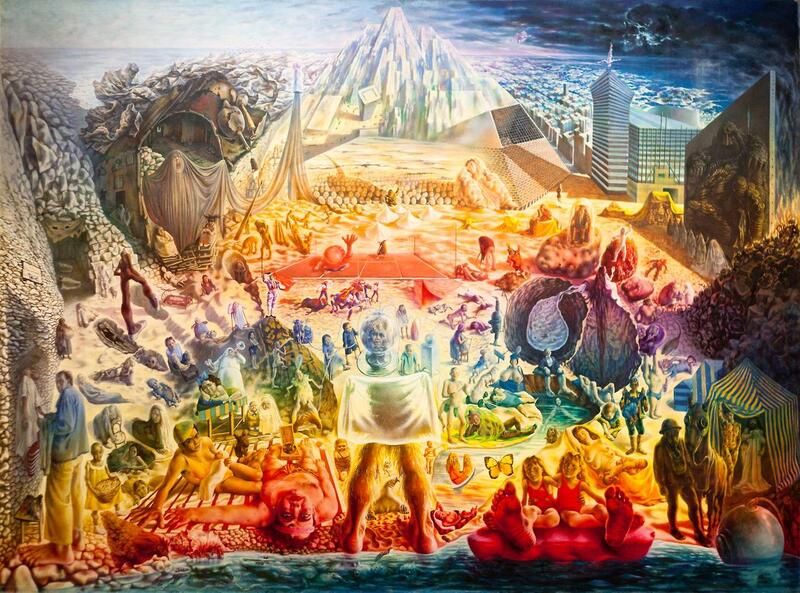 This enormous painting is a pictorial equivalent of the method of Finnegans Wake. All of its images are puns which resolve into yet other punning images. First of all, it is a giant oak tree against which a girl presses herself: she is the it in a game of hide-and-seek. The hiders are concealed in the tree itself, so many children, who are arranged like the cycle of seasons, winter children, summer children. These children, seen a few paces back, become landscapes, and eventually two folded arms, as the tree itself resolves into a foot and hand; and, further back, the face of a Russian demon, mustached and squint-eyed. Further back, the whole picture resolves into a drop of water---Leeuwenhoek's drop of water under the microscope in which he discovered a new world of little animals; the drop of crystal dew on a leaf at morning which acts like Borges' aleph or Blake's grain of sand or any Liebnizean monad mirroring the whole world around it; Niels Bohr's drop of water the surface of which led him to explain the structure of the atom. 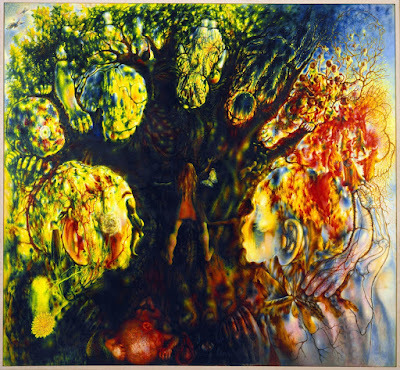 Later on, in weaving a web of interrelated artists (as he does so well all over this book), Davenport tells of a visit William Carlos Williams paid to Tchelitchew's studio in 1942 where the painter was at work on another gigantic epic painting, Phenomena.